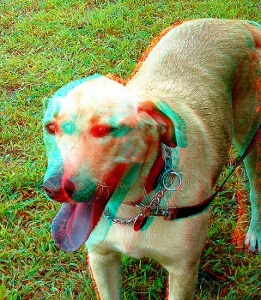 This dog would look a lot better if you had 3D glasses on. An executive from Microsoft's Xbox division says that 3D gaming is a long way away from invading your console. Aaron Greenberg, Microsoft Xbox Director of Product Management, said that despite 3D being the topic that everyone is discussing at the Consumer Electronics Show this year, he doesn't feel like the technology is going to be appearing in our living rooms any time soon. Part of the problem, he said, is that you have to sit a certain distance away from the TV for it to work, as well as the necessity to wear funny-looking glasses. "I think there's a lot of questions, to be honest," Greenberg said. "3D is great in the theater, but for the living room? I think we're a long ways away from that. In the theater there's nothing between you and the experience, but as you have other people in the room and other people walking by, well, it's not the same experience." "If the consumers want it? Fine," he said. I have to say, I don't think that Greenberg is looking at the big 3D picture here. The problems he cites with 3D tech just don't appear to be big deals, at least to me. I think that if Microsoft could design a comfortable set of 3D glasses, and with their huge R&D budget I'm sure they could, the company would make 3D millions. His last statement seems like a slap in the face as well. "Ho hum, if the plebs want something, I suppose we'll allow them to have it, no matter how much it pains us in our Redmond Tower to provide." He has heard of Avatar, hasn't he?